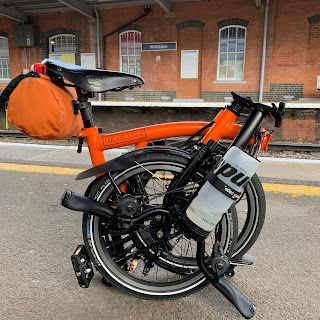 My Orange Brompton: The rain will not stop me!! Weather wise we will be treated to very warm if not muggy overnight/early morning temperatures but it is predicted to rain. This rain has been forecast as anything from a sustained light shower, periodic bursts of heavy rain and even precipitation of near biblical proportions. 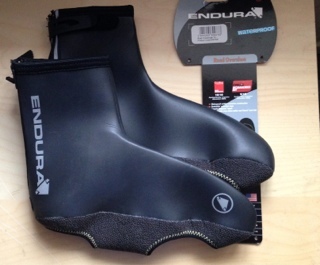 I have therefore decided to take no chances as far as my feet are concerned and will use for the first time a pair of Endura road overshoes. One bonus feature is that the lining is a rather good colour that for some reason I really like? The rest of me might not be dry by tomorrow morning but hopefully my feet will be. (If you are anything like me I hate it when my feet get wet). I have to report that after the ride my feet were wet but no where as much as if I had of worn nothing at all. This was 6 solid hours of rain so under normal conditions - perhaps a commute they'd be okay. The biggest surprise was that at the end of the ride the stitching on the sole had started coming lose and there were a couple of holes starting to form. Not very impressed! I took them back to the shop for a full refund. I have to say that I won't be buying another pair with this type of material and until I do my feet will just have to get soaked! They did a pretty good job Nigel I will give them that but if you read the update there was a much bigger problem with these. 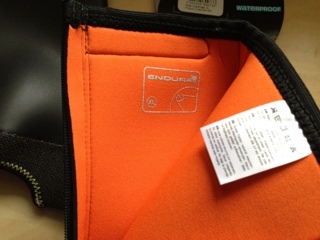 They were perfectly fine in the humidity but the update to this blog tells you what I thought of them after use. Best and cheapest way: Put on the socks you want to use. Put your feet innside thin plastic bags (the type used for a loaf of bread or similar). Put your feet innside your shoes whit the bags on and off you go. If you start off in dry weather just bring a pair of bags. Stop and put them on if rain starts.